I wonder if there is an equivalent to the Razzie Awards for schools. Without doubt, Anne Arundel County would be leading the pack of contenders. 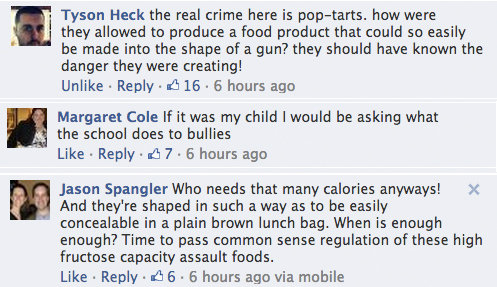 It appears that all semblance of common sense has left the building as Superintendent Kevin M. Maxwell, PhD, denies an appeal for a suspension of a seven-year old student who chewed his Pop-Tart into what a teacher thought was the shape of a gun. And to be sure no-one was traumatized by the errant pastry, the school sent home a letter to students about “the incident” and even going so far as to offer counseling services! The ludicrousness certainly did not escape Fox News. Where has common sense gone? We shared this video on our Facebook page late last night to the 58,000 people who “like” our page and 100% of the comments agreed that common sense is no longer a requirement in the Anne Arundel County Public Schools. And Margaret Cole makes a valid point. While the school administration is determining ways to regulate, pop-tarts, bullying seems to be little more than lip-service and a few pages in the Student Handbook. We documented an ongoing issue with bullying at Southern High School. A teacher admitted that administrators make him re-classify bullying incidents to something less severe. Several years ago, a student was beaten in a hallway so severely that he was flown to shock-trauma. And while the victim was in the hospital for days and faced a long recovery including partial blindness, his assailants were back in school after a very short suspension. The school district deemed the incident an “altercation” and would not comment on the punishment citing privacy concerns. You are correct. The projects did not move the grades, especially if the students did well. However, they would have had a negative effect had they done poorly. What kind of grading system is this? Are the schools holding back performing students to allow non-performing ones to look better? Is it a paper game? If your students are not in a STEM program, it is unlikely, if not impossible, for them to ever graduate at the top of their class because of the convoluted way the Anne Arundel County Public Schools have decided to factor grades. This conundrum was explained in a recent article in the South River Source. Even a Maryland Delegate Tony McConkey weighed in on the craziness. Every year, the school district requests more money from the County to operate the schools–and this is a good thing. But when they are making decisions like this, it should give people pause. 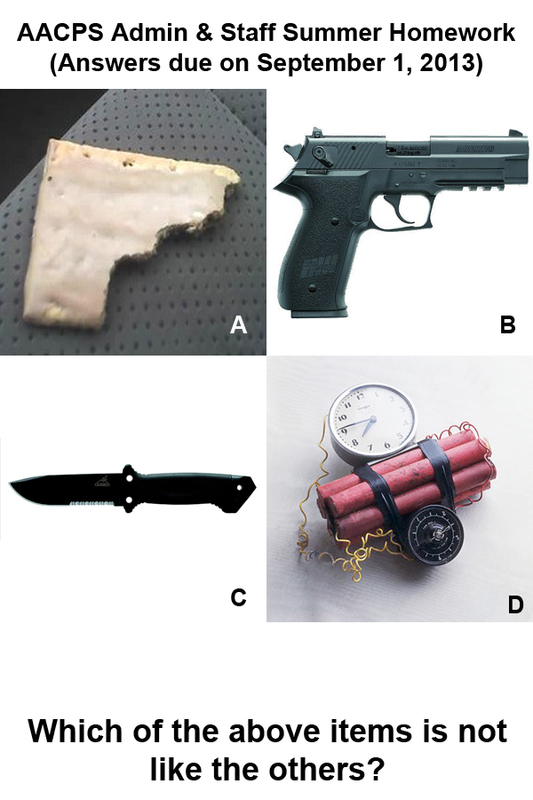 If our teachers and administrators are unable to differentiate a half-ingested pop tart from a viable threat of violence, how can we expect them to effectively manage $600 million in their annual budget? Maybe Anne Arundel County Executive Laura Neuman can ask that question now that relations between the County and AACPS have been somewhat repaired despite removing $5 million from the proposed budget. So now, a now 8-year old will have to appeal Dr. Maxwell’s decision to the full Board of Education wasting yet more time and energy on this silliness run amok. In the meantime, as schools dismiss for the summer, someone might give the teachers and administrators some summer homework…here’s my suggestion…..what are your thoughts on the whole thing?